Whether you’re a Jaws fan, a Sharknado fan or a lover of all real sharks, it’s time to celebrate. Shark Week is back! Here’s how to get the most out of the week in Sanibel Island. Sharks have been swimming in Florida waters for more than 400 million years, according to the Florida Fish and Wildlife Conservation (FWC). Sharks are an important part of the marine ecosystem, as they help maintain balance. Here’s what you need to know when sharing the water with sharks. Shark activity is at its peak in Florida from April through October, when the water is warmer and the fish they feed on are plentiful. Shark attacks are rare and the majority of them in Florida occur on the Atlantic Ocean side of the peninsula. Weather watching: Swim during clear bright days from daylight to dusk. Avoid swimming at dark, in foggy weather or after a heavy rain. Swimming buddies: Swim with friends so you can keep an eye out on each other. Stay away from shark sighting areas: Sharks are creatures of habit. If you know where sharks were recently spotted or where there was a recent attack, don’t swim in that area. Leave shiny things at home: Shiny jewelry and shiny bathing suits might have sharks mistaking that shine for the gills of a fish. Don’t swim with fish: Don’t swim with schools of fish, seabirds or dolphins. 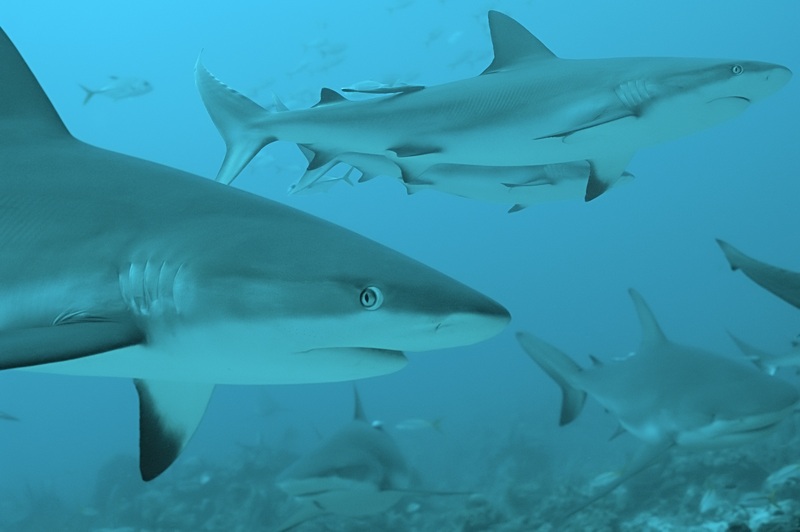 Don’t swim if wounded: Sharks are attracted to blood and human waste. Don’t splash: Sharks look for sudden movements, so swim peacefully and keep your dogs at home. Don’t swim near boats and docks: Don’t swim near structures that you don’t know what is lurking underneath. Stay out of shark territory: Channels, sandbars, deep drops and mouths of rivers can contain shark hideouts. During low tide, stay clear of lagoons and small bays. A shortfin mako shark is the fastest shark and can swim more than 60 mph. Speed: Sharks feel the need for speed. Want an example? The shortfin mako shark is the fastest and can swim more than 60 mph! Instinct: Sharks have great instinct, allowing them to be a top predator when it comes to finding and catching fish in the water. Adaptation: Sharks have adapted well over the years, learning where to find fish habitats without making their presence known. Loyal to their routes: Sharks are creatures of habit when it comes to traveling. Sharks are known for using the same routes to return to their favorite hunting spots. Strength: Sharks can chomp with a force of 240 pounds. Shark fishing is a popular activity off the shores of Sanibel Island. Daily Limit: One shark per harvester or two per vessel. Whole Condition: Landing with heads and tails intact is required. FWC Protected Shark Species: It’s illegal to harvest, possess, land, purchase, sell or exchange all shark species on this list. Hook and Line Only: Use of natural bait when using multiple hooks is prohibited. Proper Catch and Release Methods: Using these techniques can help increase shark survival rates. Specific Release Guidelines for Endangered Sawfish: The sawfish shark population has declined by more than 95 percent, so they must be thrown back. The FWC lists more information about shark fishing and you can contact Port Sanibel Marina for local information tips about shark fishing. Port Sanibel Marina’s fishing captains can plan your perfect shark fishing adventure. It’s time to rent a boat or book a shark fishing charter adventure at Port Sanibel Marina. Our professional captains know the ins and outs of shark fishing and can help you plan the perfect shark fishing trip. Remember to share those great shark fishing catch photos with us on Facebook, Twitter, Pinterest and Instagram! Need a place to stay? Book a fully furnished condo at Royal Shell Vacation Rentals. Call us at 239-437-1660 to plan your trip today!